Enrich Salon - Kandivali West Mumbai - We are market leaders in our category. In our industry, we are known for our focus on training, customer focus, service consistency and quality standards. 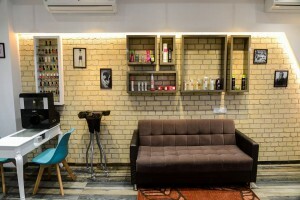 Enrich is the largest unisex salon chain in Mumbai. It is considered to be one of the elite salons. The salon offers world class services and products at accessible locations and affordable prices making Enrich the leader in the health and beauty industry. Enrich is constantly expanding. With presence at 59 locations spread over 5 different cities (AHMEDABAD, BANGALORE, MUMBAI, PUNE & VADODARA) currently offering worthy treatments at salons and spas. Enrich is dynamically living up to the expectations of loyal clientele of more than 2,60,000 and still counting. Enrich also offers professional hair and skin services with products standardized to meet stringent quality control. Book Professional Beauty services at Home in Mumbai & Pune. Get salon experience at your place. Try a Belita service today. Call us to know more. It's easier than ever to book your appointment with us. Click on the button below, and get done in a jiffy! Our first salon was set up in 1997 as a venture among friends who had no background in the industry. This created respect and partnership with technicians on the floor, and made the management focus intensely building a sense of entrepreneurship and scale. Partnerships with L'Oreal, Remy Laure, Agelock, and Christian Valmy have also contributed immensely. Our fundamental belief has always been that everyone has a gift. And a duty to recognise this in themselves and others. We practice this everyday by creating systems and services that help employees, customers and students alike - to be, look and feel at their confident best. Planet Enrich is an expression of our culture and our belief in the power of the collective. With the help of its ambassadors in every salon, Planet Enrich provides proof of this power through various activities on a regular basis.